from Atlas of Passaic County, New-Jersey : topographical, geological, historical, illustrated ; from actual surveys of each township and village / under the supervision of the publishers, assisted by the able engineers of Paterson. Outline Map of Passaic City in Acquackanonck TWP, N.J.
Facsimile of the unpublished British head quarters coloured manuscript map of New York & environs / reproduced from the original drawing in the War Office, London. TheHome Life Publishing Co.' s map of the City of New York. Map of New York City : showing passenger and freight lines, ticket and freight offices, subway, elevated, and street car lines. from New Jersey, 15 minute series (topographic) / mapped, edited, and published by the Geological Survey. Borough of Manhattan [and] the principal portions of the Boroughs of Bronx, Brooklyn, and Queens and the Business District of Jersey City. Map of Consolidated City Brooklyn. 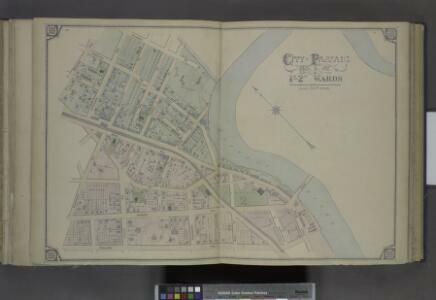 Description: from Atlas of Passaic County, New-Jersey : topographical, geological, historical, illustrated ; from actual surveys of each township and village / under the supervision of the publishers, assisted by the able engineers of Paterson.